HD Warrior » Blog Archiv » GH5 compared to the Sony FS7 Mk11 an interesting take ! 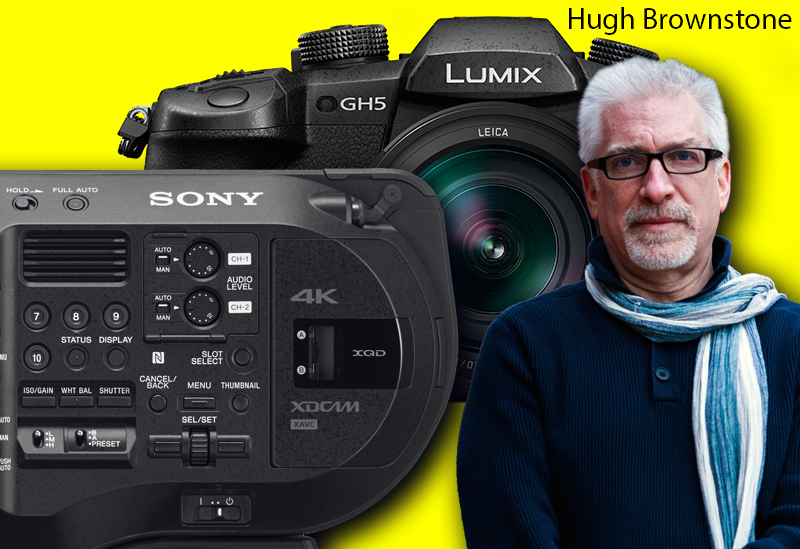 Hugh runs a web site called “Three blind men and an elephant” and gives us his opinion about the new Lumix GH5. Hugh is a screenwriter and blogger. He lives in Willistown, Chester County, with his fiancé, her son and a dog. He is the father of two grown daughters, one living in Denver, and the other living in Seattle. HDW : I am not so sure I agree with this comparison as the Sony FS7 Mk11 is a complete different animal. Thanks for posting this. The first video on the camera that really make me more interested in this product. As I think you imply above, the two are very different animals, and such a comparison is a bit meaningless. It’s another example of focussing on what I’d call “headline specs”, which don’t necessarily tell the whole story anyway. Don’t get me wrong, the GH5 does look to be pretty advanced in terms of technology with many options – but it begs the question of why on earth they haven’t put such in a more video centric body!? The GH5 looks – is – primarily a stills camera, with a video mode. (Albeit a seemingly very advanced one.) The FS7 is primarily a video camera and in that respect superior to the GH5. The YAGH for the GH4 may have been less than ideal, but in other respects it did seem to point a way forward ergonomically. Going back to a hot shoe design to get an adaptor for XLR inputs alone goes a long way IMO towards disqualifying it from being a practical competitor to the FS7 in the real world. I wonder how big a tug on a connected mic cable it would take to damage the hot shoe connector…..? Owning both an FS7 and GH5, I can say they both have their place in today’s video production company. We’re often making small business videos that don’t involve a giant crew and the GH5 (matched with a Metabones Speedbooster so the sensors are very similar depth of field and focal lengths) produces some of the best we’ve seen in small cameras. You can literally set a custom white balance with one hand dialing in the kelvins then doing color shift with the joystick without diving into menues. Turning your cinema lenses into stabilized lenses without giant gimbals? The downfall of the Panasonic GH5 versus the Sony FS7? Honestly, the biggest downside we see is just the client perception when working with larger clients. The bigger camera is heavier – bulkier – it has built in XLR (although the GH5 has a dedicated XLR1 module and there are quality pre-amps like the JuicedLink XLR module). The FS7 has a larger battery and built in ND filters which are nice perks for long form video projects like seminars. Perception is reality (sadly) and most companies we work with would rather have an FS7 than a GH5 because they just feel it will be a better video in the end. When they get comfortable with us throughout the project and we suggest actually using the GH5 due to 4k 60p and more stable imagery… They are already working with us and trust us. Starting out – we are able to more easily differentiate from the newbies who have a photo camera that also does video… Despite it’s pretty clear that NOBODY actually buys a GH5 for the photography alone. There are many cheaper m4/3 cameras – people all buy the GH5 because of the video – with the added benefit (or required functional requirement) of hybrid photo and video coverage. Example: we go film for a day in a factory and they want us to take a group photo of their team. Do we carry an FS7 and a Canon DSLR? No – just grab the GH5. Yes – I’m skipping over some advantages of the FS7 – but I’m trying to point out how the GH5 compares to the FS7 in terms of it’s advantages for some situations. Often video guys say “the FS7 is better – case closed” when in actuality that’s not always the case. Even when price isn’t an issue – there are times the GH5 just is a better choice – and there are cases where the FS7 is a better choice. Either way – both cameras have their place and the price difference is now less than ever. The question is to whether you’re requiring any certain feature over another – if you don’t shoot with a gimbal or stabilized lenses – I’d say the sensor stabilization will factor hugely into your equation for useable shots and being able to shoot with a monopod to get solid footage. If you do agency work – an FS7 may help you win some jobs – and it’s easier to rent out your FS7 to get it paid off faster as well – or bring it with in your day rate to recoup the cost difference on projects you’re already shooting – or get jobs just because you have the Sony fs7. If you exclusively sell the end video (never raw footage or sub-contracted) the client will probably never know the difference and I’d say the stills camera + 4k video in a small form factor outweighs the big camera. The client will love your great video quality at affordable freelance videographer prices versus the bigger camera budgets. So – it’s a bit of a draw. Depends on what you’re using it for. Which – to be honest – is crazy. It’s crazy that you can now compare a camera 1/5th the size and cheaper in terms of image quality and useability. Keep shooting guys – ultimately gear is just a tool to get you the shot – and the shot is only as important as the story your film is telling. client to see the difference in the end result. Our client on the shoot was actually really impressed with the speed and efficiency we could work, partly thanks to the GH5. They had a bad experience with the Red camera so they were pleased to see they could get great results and much more content with a smaller crew and set up. In future our FS7 will only be used for corporate interviews and events, GH5 and a GH5s will do the majority of the work.